Freechoice: Explore the Imperial Bath House and the fountains in the Lower Garden at Peterhof on a guided tour, or be seduced by the sheer extravagance of Peterhof’s Grand Palace, which was modelled on the Palace of Versailles. Alternatively, wander the incomparable Upper and Lower Gardens at Peterhof, including the Palaces’ majestic Fountains. This morning visit Peterhof Palace, famous for its grandiose buildings and elaborate gardens. Reveal the mysteries of Russia on a 15 day river cruise between St Petersburg and Moscow, cruise the majestic waterways on board the luxurious Scenic Tsar. From the might and splendour of Moscow to the beauty of St. Petersburg, Russia remains one of the most intriguing countries in the world. 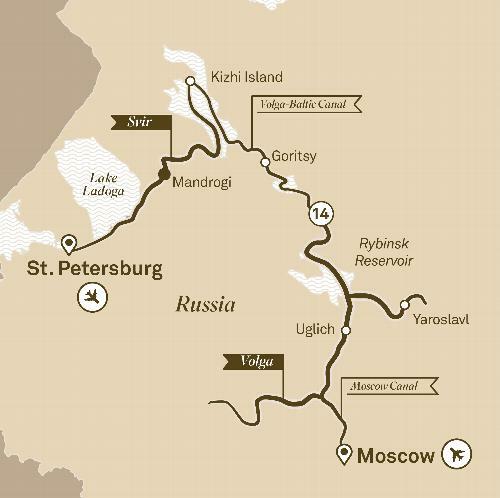 There’s simply no better way to traverse this land than along Russia’s majestic waterways. The best option by far is a luxury cruise on board the boutique Scenic Tsar with only 112 guests.